Der malaiische Gelehrte Munshi (مُنشی) Abdullah bin Abdul Kadir (عبد الله بن عبد القادر) (1795 - 1852) besucht die siamesischen Vasallenstaaten Terengganu (‏ترڠڬانو) und Kelantan (‏كلنتن‎). Er beschreibt die dort blühende Herstellung von Seiden-Sarongs. Die Rohseide wird aus China importiert. Die Seidenstoffe sind ein wichtiger Exportartikel. Ein Netzwerk von Opiumhändlern wird ausgehoben. Der US-Baptistenmissionar Dan Beach Bradley (1804 - 1873) führt in Siam westliche Geburtshilfe ein. "In 1835, when Bradley first saw Bang Plaso'i [บางปลาสร้อย] from a boat, a Portuguese sailor told him that a large proportion of its inhabitants were Chinese, that the place was remarkable for its salt manufactories, fisheries, and the cutting of timber, of which the Siamese made their anchors. Bradley did not actually set foot there until September 1838, when he was accompanied by his fellow- missionary Charles Robinson. Access to the town was restricted to the time of high tide; at ebb a stretch of some two miles of mud lay in front of the town. Like Suntho'n Phu [สุนทรภู่, 1786 - 1855], he was struck by the local custom of people propelling themselves over the mud on sliding boards, in search of shellfish. 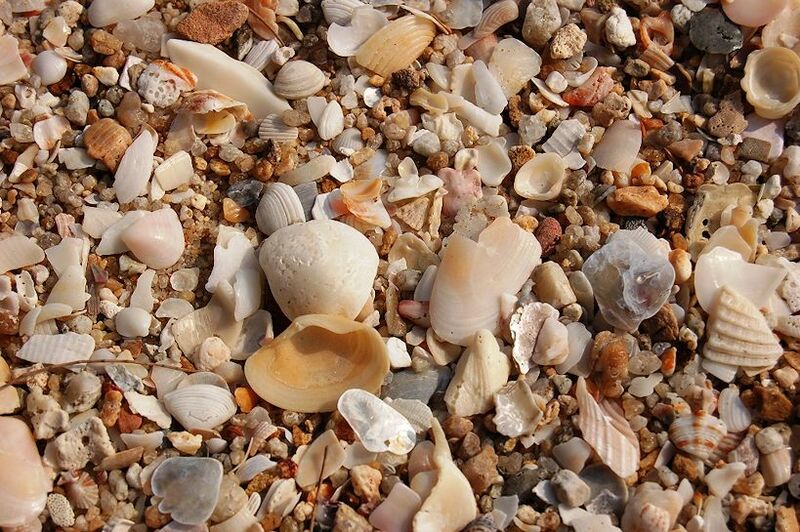 The town was built on the beach, extending north and south, on a sandy dry soil. It was not established at a river, and for its water supply it depended upon a spring of water a little distance away. Bradley was surprised to find such a large town. 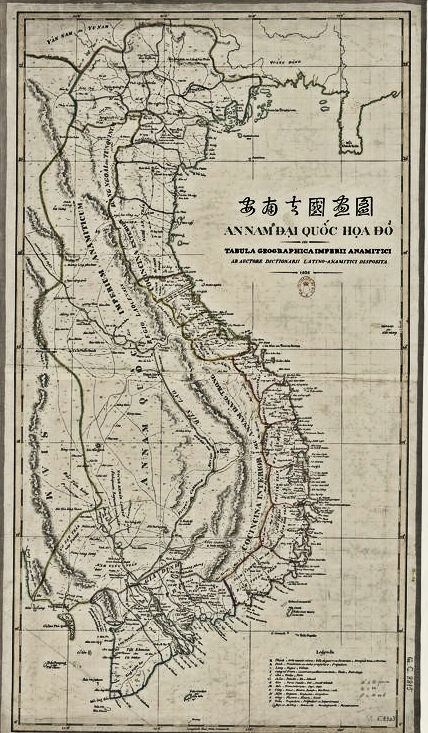 He estimated that there were no less than 5,000 inhabitants, and when he observed a crowd; noted that about two-thirds were Chinese, the rest Siamese, which, Bradley boldly guessed, could well be the relative proportions of Chinese and Siamese for the whole of the province. Excepting a few Chinese dwellings made of brick, all houses were constructed either of bamboo and attap [Nipapalm-Blätter] or of planks and tiles. He was pleased with its market, which had all the fruits that could be found in Bangkok. He visited a large Chinese-owned distillery, where the alcohol was made from molasses. Bradley —a fervent teetotaller— remarked that he encountered no intoxicated persons, adding that generally the Siamese abhorred intoxication, and that the habit of drinking alcohol to excess had only been spreading recently. 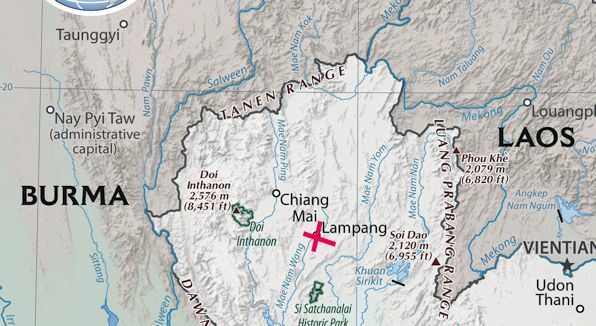 He noted three Siamese monasteries, and one Chinese temple. Most of the people he met could read Siamese, and he could have distributed ten times the amount of pamphlets he had brought. Bradley and Robinson had a chance to walk some four miles inland to visit a sugar factory. On the way, Bradley noted that the whole plain had the appearance of once having been cultivated, but now having been allowed to become overgrown with natural vegetation. The sugar mill which they visited was run by a Teochiu Chinese [潮州人]. Compared with the mills of the Nakho'n Chaisi [นครชัยศรี = Nakhon Pathom - นครปฐม] region the mills of Bang Plaso'i were but small affairs, but reputedly the sugar produced here was of better quality. Walking still further inland they saw an indigo plantation, collected details of the process of indigo manufacture, and noted fields with sugar cane, beans, sweet potatoes, yams [Discorea sp.] and pineapples. Bang Plaso'i was famous for its yams and probably supplied the greater part of Bangkok's needs. 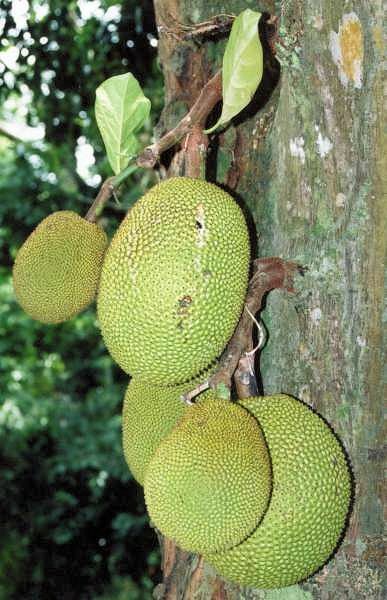 Bradley was amazed at the enormous size of mango and jackfruit trees [Artocarpus heterophyllus Lam.]." Zehn Personen werden hingerichtet. 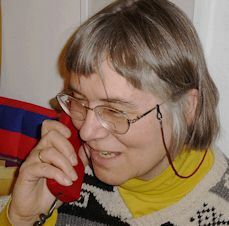 Sie sind verwickelt in eine geplante Liebesaffäre zwischen einem jungen Beamten und einer Frau des königlichen Harems. Unter den Hingerichteten sind drei Wahrsager, die dem Beamten Erfolg bei seinem Unternehmen vorausgesagt hatten, sowie zwei Brüder des Hauptschuldigen, die Mitwisser waren. Der katholische Bischof Jean-Baptiste Pallegoix (1805 - 1862) reist die Strecke Chanthaburi (จันทบุรี) - Bang Pla soi (บางปลาสร้อย = Chonburi - ชลบุรี)) - Chachoengsao (ฉะเชิงเทรา) - Nakhon Nayok (นครนายก). "When Pallegoix described the economy of Bang Plaso’i [บางปลาสร้อย] province, he noted that it possessed large salt mines and enormous shell deposits, exploited by Chinese for the production of lime. The "large salt mines" may be a reference to a relatively minor salt-evaporation industry. 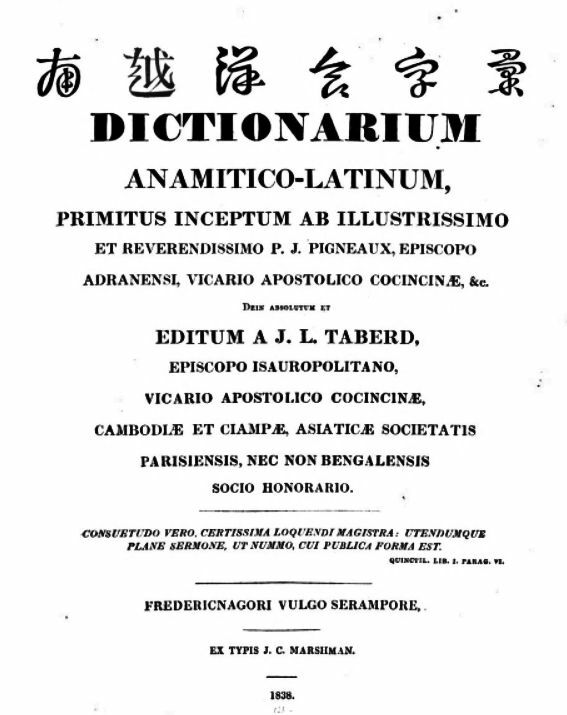 Most of Siam's salt was produced around Tha Čhin [ท่าจีน] in the Southwest. As to the exploitation of shell deposits there have been various corroborating eye-witness accounts of that industry. South of Bang Plaso'i were several coastal villages where the mining of shells was a major source of employment, the shells being sifted out from their sandy surroundings and then transported to Bangkok for its lime burners. 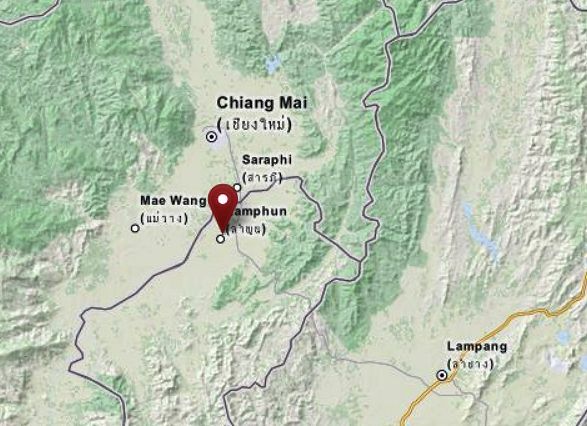 The first of these villages was Ang Hin [อ่างหิน] (presently known as Ang Sila [อ่างศิลา]), which lay just within sight of Bang Plaso’i. The name Ang Hin (Stone Basin), referred to a large pool in the rock, used for bathing and irrigating some fields." Nach Bangkok kommen 6 britische Schiffe. Das US-Schiff Stag, das in Bangkok Zucker laden wollte, verlässt ohne einen einzigen Sack Zucker Siam, da die Zuckerpreise zu hoch sind. Es ist bis 1850 das letzte US-Handelsschiff, das Bangkok anläuft. Die Zuckerpreise sind so hoch, da die Regierung den Zucker in den Provinzen aufkauft und den ausländischen Händlern zu überhöhten Preisen anbietet. Ausländische Händler dürfen nicht mit Privaten handeln. 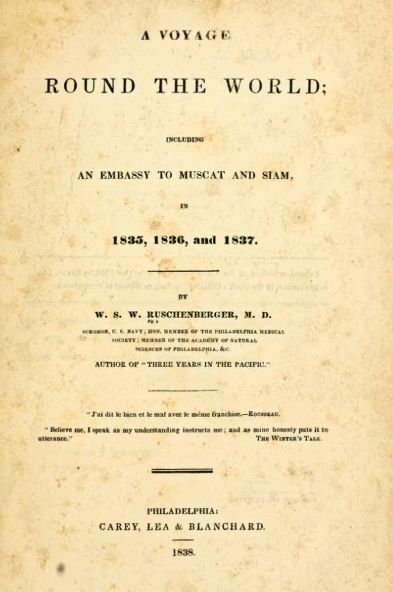 Ruschenberger, William Samuel Waithman <1807-1895>: Narrative of a voyage round the world during the years 1835, 36, and 37; including a narrative of an embassy to the Sultan of Muscat and the King of Siam. -- London : Bentley, 1838. -- 2 Bde. -- Zugleich erschienen als: A voyage round the world : including an embassy to Muscat and Siam in 1835, 1836, and 1837. -- Philadelphia : Carey, Lea & Blanchard, 1838. -- 559 S. ; 23 cm. "The government is a despotism of the most absolute kind. The king is the god, the law of the land, and his name is known only to few, that it may not be taken in vain. He is mentioned by several epithets which are considered peculiarly soft and flattering; as “the sacred Lord of Heads”—“ the sacred Lord of Lives”—“the Owner of All”—“Lord of the White Elephants”—“Most exalted Lord, infallible and infinitely powerful.” Even the members of his body are designated in adulatory terms; his feet, hands, nose, ears and eyes are never mentioned without the prefix of Lord, or sacred Lord. Every thing belonging to or attached to his majesty’s person is also styled golden. To visit him, is to come to his magnificent majesty’s golden feet—to speak in his golden ear, &c."
"The chief merchants of Siam are the king, his ministers, the Chinese, and old women. They require, from Europe and the United States, arms and ammunition; perhaps a few military ornaments, coarse cutlery, glass ware, white cotton goods, which should not be less than two cubits in width; cotton twist, from No. 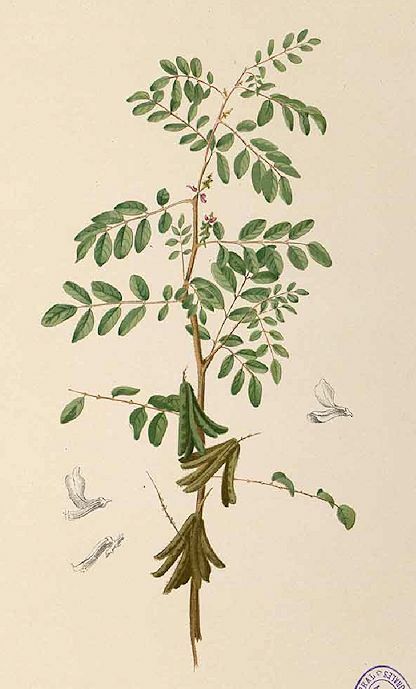 20 to 30; Siamese dresses, three yards long by forty inches broad, in star patterns, on red, green, and blue grounds, which colors should be bright; long ells, red and green: furniture chintz; ladies’ cloth, red, yellow, green, light purple, and light blue; steel, in small bars, the size of nail iron, which, for this market, should be put up in tubs, one hundred of which are enough at a time, instead of cases. American cottons are now sought for, though afforded at a higher price, because they have proved themselves to be much more durable. 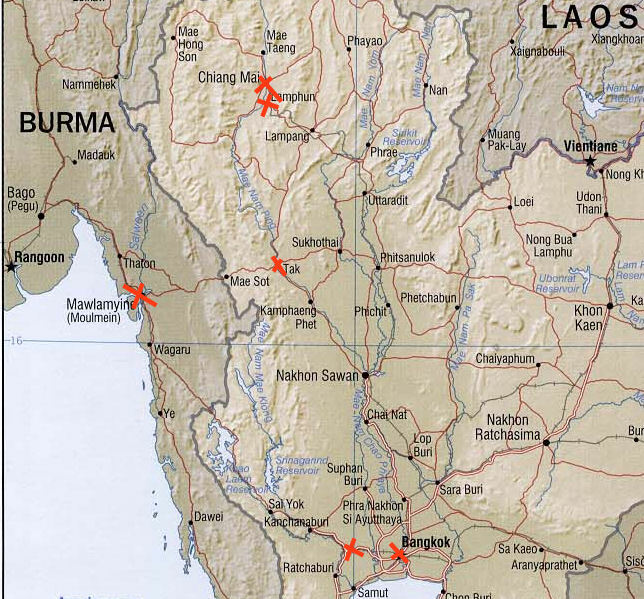 There is an opening for the introduction of American cottons, through Bangkok, to the countries lying north of Siam. 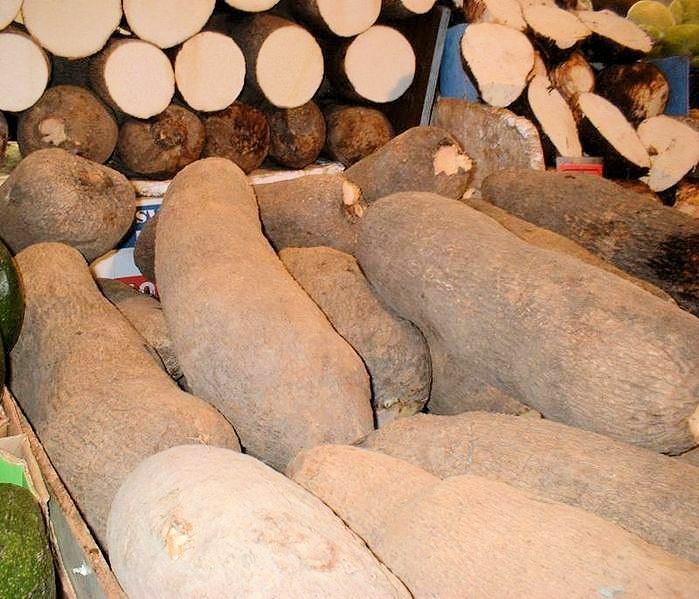 For the above articles they offer, in exchange, sugars, tin, ivory, sappan wood, (Caesalpina sappan, ) rose wood, rattans, a variety of drugs, iron of a superior quality, &c. Sugar, the staple article, is at an average price of eight ticals per picul of 133 1/3 lbs., may be put on board for about five dollars per hundred: whether it will yield profit at this price, after paying freight, home duties, interest, insurance, &c., I am not merchant enough to decide." "However my opinions may be swayed by philanthropic views, without discussing the question of its intrinsic necessity on the score of religion, I would encourage the Christianization of all Asia, Polynesia, and indeed of all the world, because I think it is sound policy. By such a change, commerce must be benefitted. Our merchants, upon a candid investigation of the subject, will probably find their interest in doing all they can in behalf of those pious individuals, who sacrifice the honors of this world, in earning a glorious crown in the next, by attempting to put misbelievers in the path to sound morals, true religion and rational liberty. To what extent our trade in the East would be augmented by the conversion to Christianity of Siam, Cochin-China, China and Japan, it is impossible to conjecture. When the half naked millions of Asia shall attain Christianity, and with it, all the new wants which the necessary change in their social condition will produce, the soil of our country, as rich and vast as it is, will be scarcely adequate to supply them. A new and extensive mart must be opened for out- manufactures of all kinds, and even the literary will find an increased demand for their labors. Hundreds of ships will spread their sails to the eastward of the cape of Good Hope, destined for the shores of Asia and the isles scattered in the southern ocean, and commerce will pour her wealth, gathered in the old world, into the lap of the new." "I accompanied Dr. [Dan Beach Bradley, 1804 - 1873] and Mrs. [Emilie, geb. Royce, 1811 - 1845] Bradley from their humble dwelling, where they have all the little comforts which circumstances allow, to the dispensary, a small floating house on the river. The voyage was made in a sampan of the commonest kind, without shelter from a blazing sun. We found nearly a hundred individuals crowded under the little veranda, and many, still in their boats, awaiting the doctor’s arrival. Among the number was a considerable proportion of talapoins in their yellow robes, and I thought all manifested pleasure at our coming. The males on the veranda were separated, but a stranger would be unable to distinguish the sexes by their features, and, being aware of this, the doctor, very kindly said, "These are the females, and those the males." The front of the dispensary is divided into two apartments, one occupied by Mrs. Bradley, who dispenses prescriptions to the women, and, where the treatment of a case is continuous, manages the detail, thus leaving Dr. Bradley more time to bestow on new, or more urgent cases. In every instance, the prescription is written on a slip of paper, upon the reverse of which is a text from Scripture, in Siamese, and the patients have acquired the notion, that this is an important part of the treatment Whether this plan of disseminating the Scriptures be a feasible one I question; seeming very much like exhibiting clippings from the sculptor’s chisel as a sample of a fine piece of statuary, or a brick as a specimen of architectural structure. Besides, it may lead to the impression that these texts arc spells essential to the cure of disease. I spent several hours here, and saw many specimens of disease, which I had never before seen: A variety of the affections of the skin which are scarcely known in our country. The diseases of the eye are very numerous, which may possibly arise from constant exposure in the low sampans, to the reflected glare of the sun from the surface of the river. 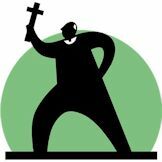 Ulcers of various kinds abound." "Mr. Dean [William Dean, 1807 - 1895] devotes every afternoon to prescribing for from forty to fifty Chinese patients, many of whom are sailors from the junks trading here, and on Sundays he preaches to a small congregation, in Chinese. He has charge of the Chinese church, consisting of five members, three of whom he baptized. Besides the afternoon patients, he dispenses medicines to about a hundred individuals during the week. Professing but a limited knowledge of the healing art, his most difficult cases are referred to Dr. Bradley." Der Brite Thomas Swinburne lässt eine Komposttoilette patentieren. Es gibt aber schon vorher Komposttoiletten, u.a. seit Jahrhunderten in China. "Hundreds of Chinese, armed to the teeth, awaited him on the bank ... wherever the Chinese went they took their secret societies [三合會] with them. These indeed were practically the only social organisation they had ... The influx of Chinese was so great, that it was beyond the capacity of the Malays to keep order and the Chinese, free from any control ... began faction fights among themselves." "On May 18 of that year the British sloop Wolf was lying in Trengganu [ترڠڬانو)] roadstead, off the eastern coast of the Malay Peninsula, and soon after eight in the morning she sighted six large Illanun prahus standing towards a large Chinese junk which was in the offing. The operations of the prahus, as they closed on the junk, were visible from the masthead of the Wolf, and they were seen to begin the attack with a hot fire from their guns, which was vigorously answered from the junk. The Wolf immediately got under weigh, but had to work to windward, and unfortunately her own armed boats were absent, having been despatched on the preceeding day to the Redang Islands [ريدانج] in search of some Illanuns who had lately killed and wounded a number of natives from Trengganu. About midday, however, the Diana (Captain Congleton) was descried to the northward, and Captain Stanley of the Wolf promptly sent off to her his gig and jolly-boat, with two officers and a party of seamen and marines, with orders for Captain Congleton to proceed to the assistance of the junk. It was not until after four o’clock that the Diana, with the party from the Wolf, came up with the pirates, who were then drawn up in line astern the junk, and fired upon the Diana as she approached. But now they had a different sort of enemy to deal with, and the steamer, stopping her paddles as she came opposite each prahu, and being able to get her guns to bear with terrible effect, poured in a destructive fire, stretching the pirates in masses on their decks. Even so the largest prahu maintained a fierce resistance, keeping up the contest until half-past six, when she was boarded in a sinking state. This vessel was fifty-six feet long and fifteen feet in beam; and she had to be cut adrift from the Diana and sank after the people on board her had been removed. The other five boats, favoured with a breeze, hoisted sail and edged away to the southward, with the Diana in chase. As she was closing upon them the swift darkness of the tropics descended and enabled them to make their escape, but from the shattered and disabled condition to which the steamer’s fire had reduced them, it seemed likely that they would be forced to abandon several of their vessels, for scarcely any of them could muster more than two or three oars a side and they seemed to be bailing nothing but blood. Thirty prisoners, eight of them desperately wounded, were taken on board the captured prahu. These men acknowledged to 360 men being on board the six prahus—of whom ninety were killed and 150 wounded. They openly confessed that they were pirates, and said that they were commissioned by the Sultan of Sulu to go and plunder on his account. They acknowledged that they had taken, during the three months of their cruise, three Malay boats laden with rice, also one Chinese, a Siamese, and three or four Malays who had been found on board the captured prahu. Each of these men had about his neck a twisted rattan collar by which he could be made fast at night. Eighteen of the pirates captured by the Diana were brought to trial before the Recorder of Singapore, at a special criminal session held on June 7, 1838. The charge against them was that they had committed an act of piracy near the Sambas River (western Borneo) on the preceeding April 25. Four others were in hospital too severely wounded to allow their being arraigned. The witnesses against them were the Malays who had been found on board the captured prahu. 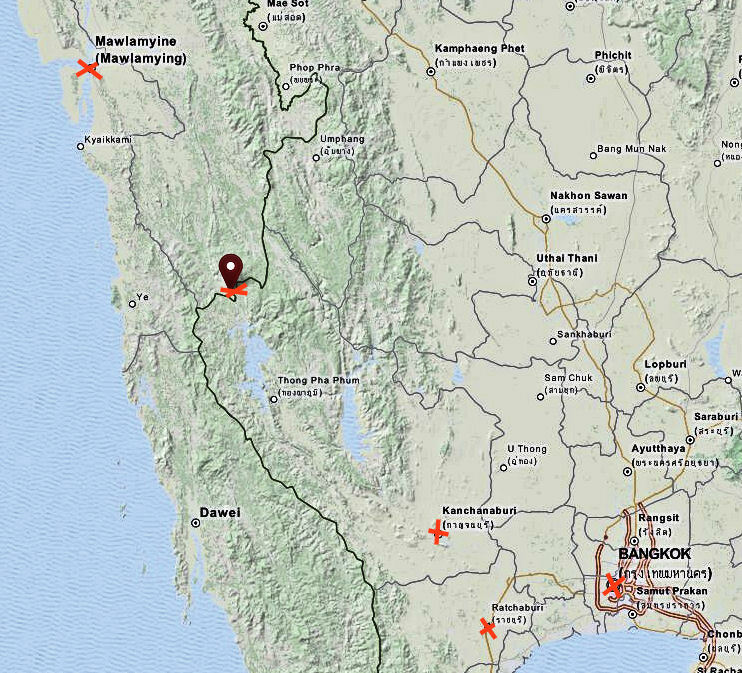 Sabat, the first witness called, deposed that he resided at Pontianak [ ڤونتيانق‎ / 坤甸市] on the west coast of Borneo. About a month previously he and eight others, being on a trading voyage in a boat laden with coconuts, oil and sago, had been captured off Tanjong Datu by six large Illanun prahus, well manned and armed. He and three of his companions were put below in one of the prahus, bound hand and foot, and had rattan collars fastened round their necks. He was told that the other five persons taken with him, being hajis, were released by the pirates and set on shore at Sirhassan Island. 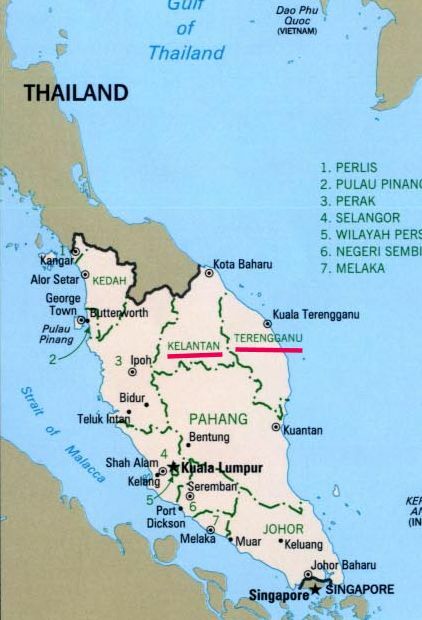 The pirates touched at several places on the east coast of the Malay Peninsula near Kelantan [‏كلنتن] and Trengganu. The witness concluded by giving an account of the attack upon the junk and of the Diana coming to the rescue." 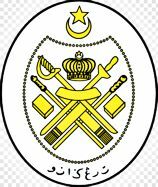 Rebellion von Kedah (‏قدح‎) (heute zu Malaysia gehörend) unter Leitung von Tunku Muhammad Saad und Tunku Muhammad Taib, Neffen des seit 1821 in Penang im Exil lebenden Ex-Sultans Ahmad Tajuddin Halim Shah II. Die Revolte wird mit britischer Hilfe vom Chinesen Wu Wen-shuang [吴汶霜 ? 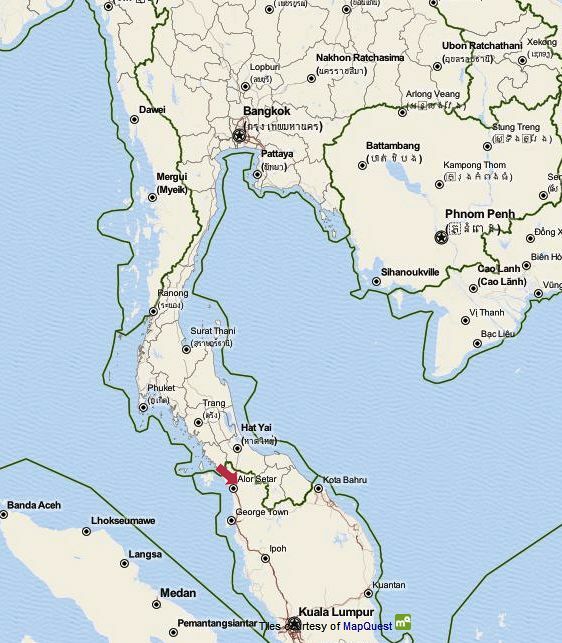 ], ehemaliger Gouverneur der Provinz Songkhla (Singgora / สงขลา), mit vier Chinesen-Regimentern niedergeschlagen. 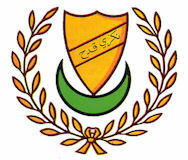 "In 1838 another rebellion broke out in Kedah [‏قدح]. A force of Malays entered the country from British territory, and for the second time expelled the Siamese. As in 1831, the supplies and many of the invaders came from Penang and Province Wellesley. The natives in the Straits Settlements and the majority of the Europeans who were not officials sympathised with the rebels and assisted them. The Government of the Straits, holding itself bound by the Burney treaty, at once blockaded the Kedah coast. 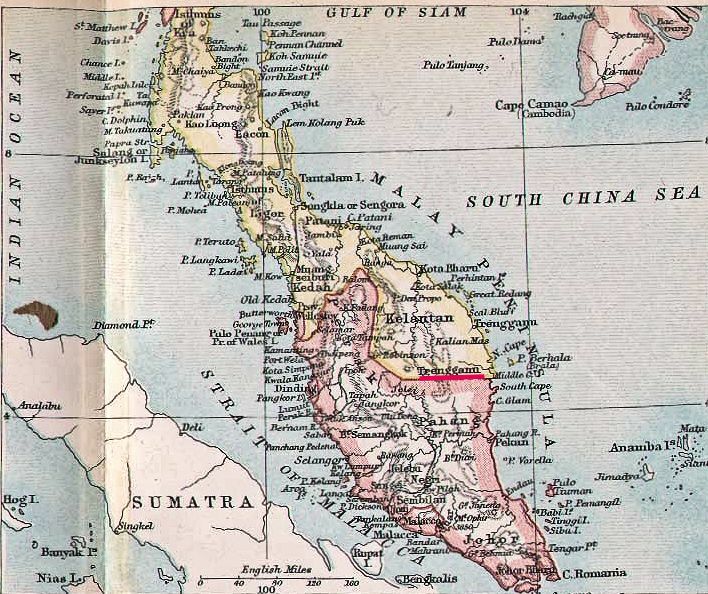 The British warships did not attack the Malays, but by preventing the arrival of arms and reinforcements from Penang they contributed largely to the failure of the rebellion. The Directors and the Government of India entirely approved of the action of the Straits Government. In 1839 the Siamese reconquered Kedah and drove out the rebels." 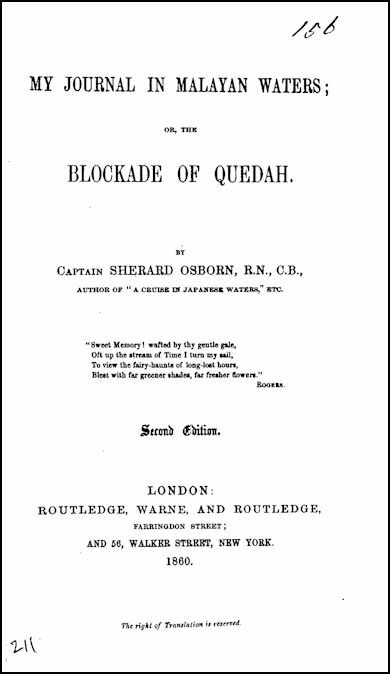 Osborn, Sherard <1822-1875>: Quedah; or, Stray leaves from a journal in Malayan waters. -- London : Routledge, 1857. -- 360 S. : Ill.
""It is almost impossible to find a family of some years standing here that has not been severely visited with the small pox with the loss of some two or three or more lives. A very large majority of the inhabitants are very thickly pitted shewing that they were once sick of the small pox." He also noted that the sickness returned every year, and recorded a seasonal pattern: it commenced at the end of the wet season and lasted throughout three months of the dry season. Transposed to the European calendar, this meant that the annual scourge occurred between November and the end of February. " David Richardson (1796 - 1846), Arzt der britischen Honourable East India Company in Moulmein (မော်လမြိုင်မြို့), reist von Moulmein über den Drei-Pagoden-Pass (ด่านเจดีย์สามองค์) - Kanchanaburi (กาญจนบุรี) - Ratchaburi (ราชบุรี) nach Bangkok wegen Handelsbehinderungen durch den Chao Hua (จ้าอยู่หัว) von Chiang Mai (เชียงใหม่), sowie um über Handelsverbindungen zwischen Tenasserim (တနင်္သာရီတိုင်းဒေသကြီး) und Siam zu verhandeln. 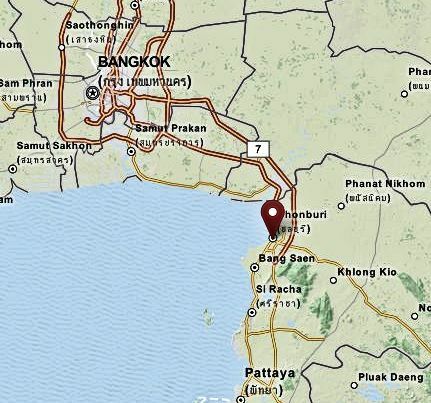 Richardson bleibt fast sechs Wochen in Bangkok und wird am 1839-02-17 von Rama III in Audienz empfangen. 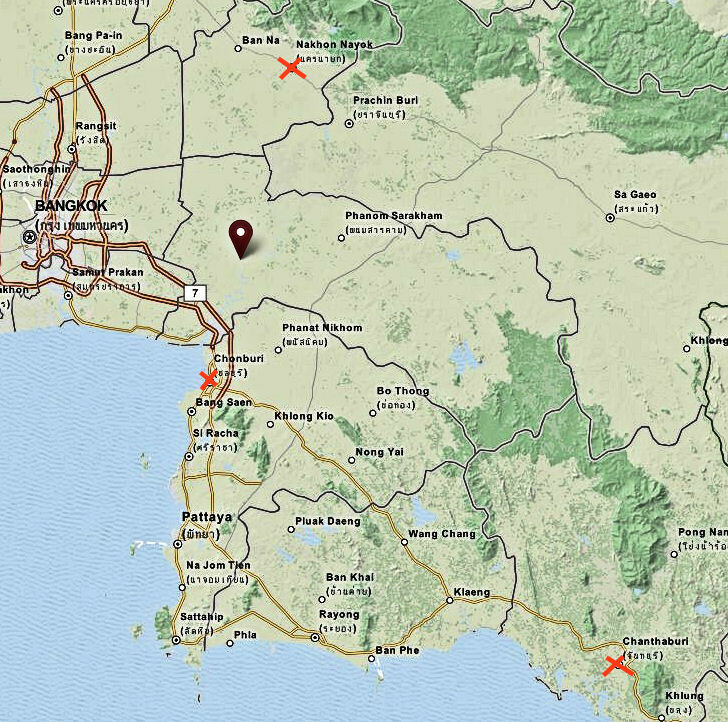 Am 1839-03-19 verlässt er Bangkok nach Nakhon Pathom (นครปฐม) - Tak (ตาก) - Lamphun (ลำพูน) - Chiang Mai (เชียงใหม่) - Tak (ตาก) - Moulmein (မော်လမြိုင်မြို့).